I am a sucker for positive energy. I mean who isn't right? We all need positive affirmation every now and then especially with how stressful everyday living can get. Life is so fast-paced nowadays that it isn't uncommon to lose track of who you are and what you want to get out of life. Dreams of becoming a painter or a dancer are often overshadowed by bills and other responsibilities and you end up living your life as a servant to these seemingly important but rather trivial details of living. Which is why we all need something to act as a little reminder of who we are, what are goals are and how good we actually have it. 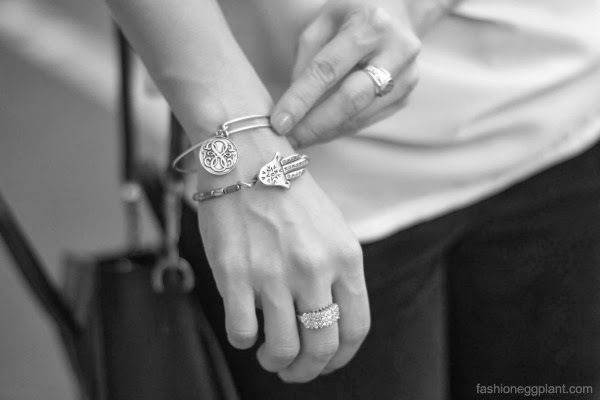 This is where Alex and Ani come in. Alex and Ani create bangles to commemorate and represent every milestone and aspect of your complex personality. What results is a beautiful jewelry stack that tells the story of your life. Something for keeps, something you will want to have on all the time regardless of what your outfit is. What's even more remarkable is that Alex and Ani bangles are produced entirely in Rhode Island to give jobs to the many Americans affected by the economic recession. Each piece is created by hand and uses 100% recycled metals from local mills to create socially and environmentally conscious bangles of the utmost quality. I was so smitten that I actually summed up the courage to ask if I could purchase one of the bangles on display right there and then to compliment the "Path Of Life" bangle I was given as a press gift. My choice? A Hamsa Hand from their Vintage 66 Moroccan Refuge collection to ward off bad vibes and abusive people. Alex and Ani is currently available at SM Aura.